Global Mail is an Cosmo based web email client that can be easily integrated with any IMAP/SMTP email servers. 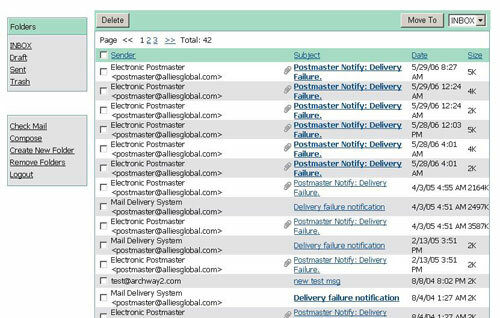 The most unique feature of this application from other webmail system is that it can be plugged into any web pages with a few lines of code. Also, just like all other Cosmo applications, Global Mail is assembled together from interchangeable parts. This seems every aspect of this application, including the user interface, the various actions and data storage, can be customized by replacing the interchangeable parts without changing code. Being an Cosmo application, it also means that any data fields displayed can be added, removed or modified without code changes.